The actual release date was originally rumored to be the following week, but an internal document from AT&T suggests that the iPhone 7 won't hit shelves until September 23—quite a bit later than initial reports. However, this is just AT&T's timeline, so other carriers could potentially have the iPhone sooner, or even later, for that matter. 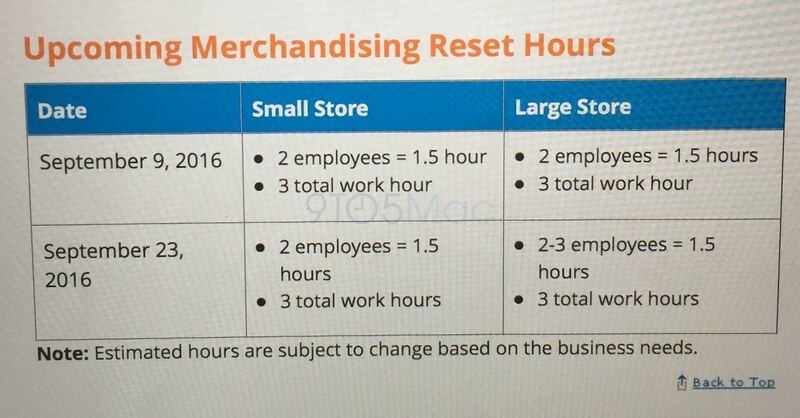 The two dates in the above image are key, as they depict AT&T's "Merchandising Reset" hours. September 9 could very well be the day that Apple announces the iPhone 7 or starts preorders, which would mean that AT&T stores should be updating their advertisements on that date. If that's the case, it would only make sense that September 23 is on the calendar as the day the iPhone 7 actually hits shelves, which would explain the call for another "Merchandising Reset" after a mere two weeks. Evan Blass has proven to be very reliable when it comes to smartphone leaks, and he has stated that the iPhone 7 will hit shelves on September 16, which is one week off from this AT&T leak. Either could be totally possible, since iPhone units usually hit stores on Fridays, and the iPhone 6 only had 1 week in-between preorder and release, whereas the iPhone 6s had 2 weeks. As the big day approaches, we'll know more about the new features in the iPhone 7. As of right now, we're already convinced that the new model will be the first iPhone to not include a headphone jack, instead going with a Lightning-to-minijack adapter that should be included in the box. Other rumors speculate that the iPhone 7 will be thinner, possibly waterproof, and use a dual-lens camera in some models. If you're tired of waiting, you can at least get a taste of the iPhone 7 experience by installing iOS 10 on your phone right now. Overall, there are a lot of changes in store for Apple's mobile operating system, so be sure to check out our coverage on all of the cool new stuff.